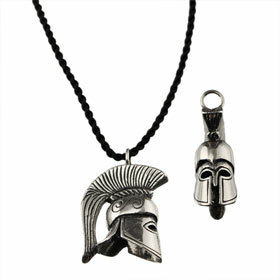 Greek sterling silver pendant modeled after a Corinthian Trojan Warrior Helmet. The stylish sterling silver hoop attached to the top (loop approx. 4mm) allows this beautiful charm to be strung on almost any chain or cord of your choice. It comes with a knotted leather cord. Pendant is oxidized for an antique look and contrast.